INDIANAPOLIS -- Over the next 2-3 years, the North Split will be reconstructed, but the current I-65 construction has some of the people living near the split thinking differently about the upcoming changes. Jonathan Evans' townhome backs up against I-70, not far from the North Split. 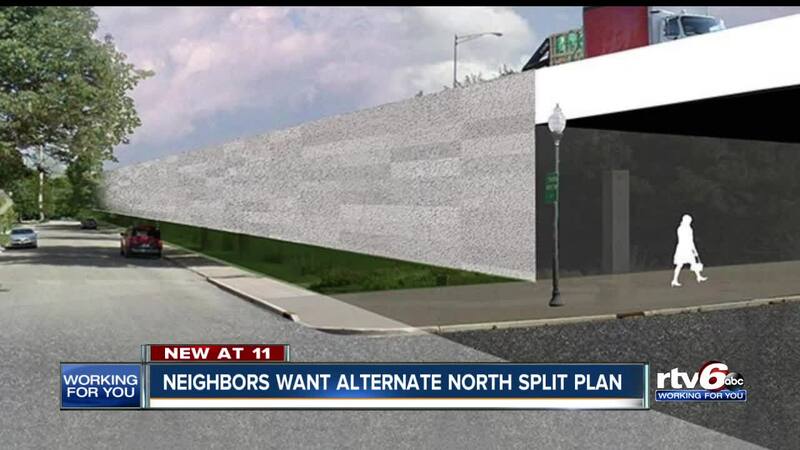 The proposal from INDOT would widen I-70, which would eliminate the greenspace behind his house and replace it with a wall. "The initial proposal that I heard from INDOT was not good at all," Evans said. "All the trees would be gone." Evans, along with many of his neighbors, are supporters of the work Rethink 65/70 is doing to try and present alternative construction plans for the North Split. The main proposal would replace the interstate with a multi-model boulevard system. The proposal was examined by INDOT, which determined that it would increase traffic delays by 145 percent in the evening. Jim Marron, who lives near the split, isn't buying it. He says the current bridge revitalization projects, such as I-65 north of downtown, have shown the interstate isn't necessary. "INDOT keeps saying that it's gonna cause a lot of problems and we can't do it," Marron said. "We can't shut down 65/70. We can't make a boulevard system because of the traffic issues. Traffic issues haven't really been bad from what I hear, so hopefully, it helps our case. INDOT is targeting 2020 as the earliest projected state time for the North Split. INDOT has held several community feedback meetings on the North Split project, and examined several alternative options from the feedback.